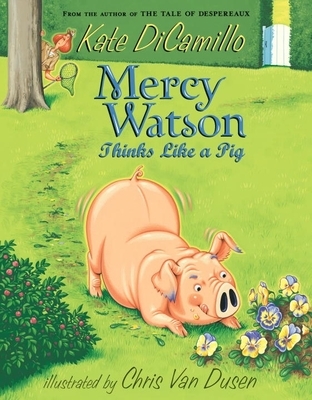 Kate DiCamillo is the author of the first four stories starring Mercy Watson. She is also the author of THE TALE OF DESPEREAUX, which won the Newbery Medal; BECAUSE OF WINN-DIXIE, which received a Newbery Honor; THE TIGER RISING, a National Book Award Finalist; THE MIRACULOUS JOURNEY OF EDWARD TULANE, winner of a BOSTON GLOBE-HORN BOOK Award; and the picture book GREAT JOY. She lives in Minneapolis. Shiny, stylized artwork captures all the fun of Mercy’s capers. Fans of the series will welcome this addition to Mercy’s adventures. As always, Mercy is a blue ribbon winner. The characters are hilarious, partly because they are so true to life. Illustrator Chris Van Dusen's pictures add to the story (Francine Poulet's license plate reads "CLUCK"; Mercy's bowl of lemonade is garnished with a slice of lemon). Young fans no doubt already find themselves craving a new Mercy story in much the same way that the porcine wonder pines for hot crunchy toast dripping with butter. Mercy Watson fans will surely love this deliciously, ridiculously funny story…Chris Van Dusen has produced delightful illustrations that perfectly compliment Kate DiCamillo’s prose. Funny, giggly, and silly…hilarious, bold, brightly colored illustrations that almost glow.